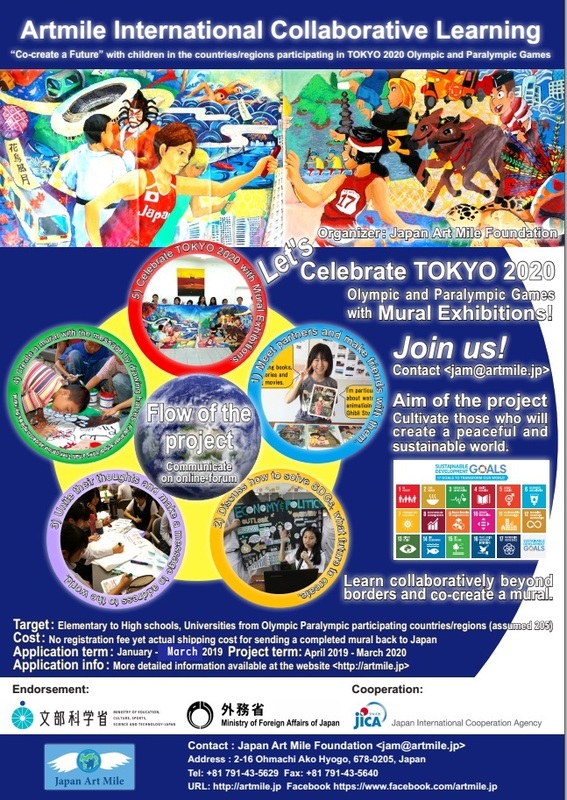 Artmile International Collaborative Learning “Co-create a Future with children in the countries/regions participating in TOKYO 2020 Olympic and Paralympic Games” is a special project in deepening collaborative learning on SDGs and aiming at celebrating TOKYO 2020 Olympic and Paralympic Games with the murals. The period of accepting applications, the start of the project, the learning schedule are different from the past ones. Please read the following explanation and notices and apply it in time. This project is endorsed by the Ministry of Foreign Affairs and the Ministry of Education, Culture, Sports, Science and Technology and is supported by Japan International Cooperation Agency and Tokyo Metropolitan Government. Furthermore it is certified by the Tokyo Organising Committee of the Olympic and Paralympic Games. Japan Art Mile (JAM) implements Artmile International Collaborative Learning 2019, aiming at cultivating global citizens who respect diverse cultures, have a global perspective and take actions to build peace and drive sustainable development in collaboration with people with different cultural backgrounds. Students of paired schools select a learning theme from 17 Sustainable Development Goals (SDGs) and research what are problems on each side, and discuss what they can do to solve the problems to achieve the goal. Students co-create a mural (1.5m by 3.6m) by drawing halves (one by a Japanese school, the other by their partner school abroad) with a message of peace and sustainable development. JAM provides an online forum to each pair as a communication tool, where students share, exchange and discuss their research, thoughts and ideas throughout the project. The learning schedule is different from the past. The curriculum model will show you the flow of the learning and when and what to do for the collaborative learning. The schedule is a full year schedule (including long holidays), considering all the countries of the northern and southern hemispheres. Many schools in the northern hemisphere have two or three month holidays in June-August, on the other hand those in the southern hemisphere have their holidays in December-February. Each pair of Japan and their partner schools are expected to make their own schedule considering both long holidays. Consider the schedule flexible. Celebrate TOKYO 2020 Olympic and Paralympic Games with the murals and convey the children/youth’s messages to the whole world. *Schools in developing countries where shipping-cost impedes to participate, consult JAM office. JAM will send you “Entry Sheet” and ask you to fill it out and submit as soon as possible. JAM will decide your participation from the content of your “Application Form” and “Entry Sheet”. For Artmile 2019, only one school from one country is admitted. In March-April JAM will inform you if your school is admitted or not by email. In April JAM will introduce a Japanese partner school to you and guide how to start the project. Copyright © 一般財団法人ジャパンアートマイル All Rights Reserved.